Thursday night finally brought some nice track & field weather and many of the Madison Memorial JV athletes took advantage at the rescheduled Big 8 JV Invitational. The event is not scored but we do record times, distances, and heights. The boys and girls teams saw personal bests by 35 athletes! The hard work from practice and the weight room is showing up in competition. Some athletes earned the right to compete at the varsity level with their performances from Thursday night. The competition between teammates for varsity spots will make all the athletes better. We need to continue to be at the top of our game as many athletes will compete 2 - 3 per week in the next two weeks as we lead up to the city and conference championships. Keep improving, keep striving for your best, keep up the good work. 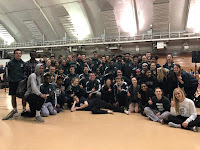 A big shout out of THANKS to all the JMM athletes who helped out working the meet Thursday night...we did a great job hosting this meet (and we even got the hurdles on and off the track well :)!